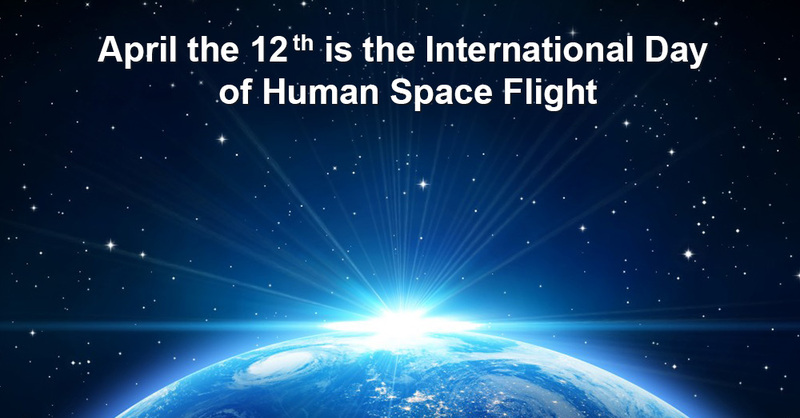 April the 12th is the International Day of Human Space Flight! Today, on April the 12th, Russia celebrates the Cosmonautics Day, which is known around the world as the International Day of Human Space Flight! The holiday is dedicated to the date of the first manned space flight. In 1961 the Soviet cosmonaut Yuri Gagarin circled the Earth on the Vostok-1 spacecraft and successfully landed in the USSR. The flight became one of the most significant human achievements in the 20th century. After the flight Gagarin became one of the most popular people in the world; he was also honored with a great number of foreign awards. It was evident that this event would always remain in the history; therefore, it was just a matter of time to institute the flight date. In 1962 Gherman Titov, Gagarin’s backup man and the youngest cosmonaut in the history of space flights, voiced the initiative to institute Cosmonautics Day – April the 12th. The holiday named Cosmonautics Day was celebrated in the USSR and now it is celebrated under this name in modern Russia. Later, in 1968 according to the decision of the General Conference of the Fédération Aéronautique Internationale (FAI -World Air Sports Federation) April the 12th was celebrated as the International Day of Aviation and Astronautics. The holiday acquired its modern status 50 years after the flight: in 2011 the UN General Assembly proclaimed April 12 International Day of Human Space Flight. In Russia this holiday is widely celebrated. On this day you can attend various thematic exhibitions, and conferences; popular science lectures and seminars are run. Many countries have also held a Yuri’s Night event in order to increase the interest in the space study and to encourage new generations to take up the space research. The launch of the spacecraft Vostok-1 with a man on board was preceded by a few test flights with animals and special mannequins on board. The spacecraft Sputnik-10 which carried a dog named Zvezdochka, a few mice, guinea pigs and the mannequin Ivan Ivanovich was launched on March 25. The Sputnik-10 flight simulated the future manned launch into the space: the spacecraft control systems, automatic equipment that controls the module work, ejection and life support systems were perfected. Similar to the future Yuri Gagarin’s flight, this flight was in automatic mode, as the scientists, especially psychologists did not know how the cosmonaut’s mind would be affected by zero gravity, therefore, the manual control was meant to use only in case of emergency. In the morning, at 9:07 Moscow time, the spacecraft with a cosmonaut on board lifted off from the Baikonur Cosmodrome Site no 1. That was the moment when Gagarin said his famous “Let’s go!” (Poyekhali!). The flight, which lasted 108 mines, despite some incidents, was a success. Gagarin did not need to use the manual control over the spacecraft. Thanks to backup safety systems, the automatic control worked properly, and the problems with the brake system could not affect the flight. Yuri Gagarin orbited the Earth once, and he carried out simple experiments: he was drinking, eating, taking notes with a pencil, evaluating his condition in the condition of zero gravity. He recorder all his observations on a tape recorder. At 10:25 Moscow time the spacecraft started entering the Earth atmosphere. During the descending Gagarin suffered 8-10 g acceleration which he was prepared for. It was much more difficult to overcome a psychological pressure: the temperature outside the spacecraft reached 3-5 degrees Centigrade, and the reentry module was crackling. At the height of 7 meters Gagarin was ejected and continued his descent on a parachute. Because if the failure in the brake system, Gagarin landed 2,800 kilometers to the west from the scheduled pace of landing. He also experiences some problems while descending – there was a risk to land in the cold water of the Volga River. However, thanks to his pre-flight training he managed to take the parachute away from the river. The first people who welcomed Yuri Gagarin back to the Earth were the wife of a local forester and her 6-year-old daughter. Gagarin’s space flight is often compared to such significant milestones in the human history as the discovery of America or the first flight over the Atlantic Ocean. Gagarin started the era of manned space flights. Gagarin’s flight was followed by the first extravehicular activity by Alexey Leonov, the first international spaceflight (Soyuz-Apollo program), the first man landing on the Moon and other significant stages in the space exploration. It is difficult to imagine the modern world without hundreds of spacecrafts on the Earth’s orbit, and without people in the space either.